I designed the Vubu before the Pungwe, and as the Pungwe is based on the Vubu design, read my ‘From the Designer’ write-up on the Vubu before you continue. The obvious difference between the Vubu and the Pungwe is that the Pungwe is shorter and a bit narrower. In other words, it is smaller. This means that it doesn’t have the same weight carrying capacity as the Vubu. 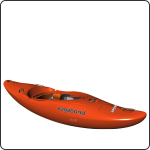 If you tip the scale over 90 kg / 200 lb, the Vubu is most likely the better option for you. Conversely, if you’re a smaller person weighing under 60 kg / 130 lb on a scale and if you are not interested in extreme racing, you pretty much should go for the Pungwe instead of the Vubu. If you’re somewhere between 60 kg / 130 lb and 90 kg / 200 lb, your choice between these two kayaks will be determined by what you intend to do with it. The Vubu is faster than the Pungwe, but the Pungwe is slightly more manoeuvrable. I gave the Pungwe a little bit more rocker in comparison to its length, which makes it turn easier and also makes it boof super easy. For big volume creeks, where speed and the ability to punch through holes is more important, go for the Vubu. For more technical and lower volume creeks, where quick reaction times and the ability to fit into micro eddies are more important, go for the Pungwe. If you’re on the higher end of the weight range and want to do multi-day trips, go for the Vubu to handle the extra weight. If you’re on the lighter side, the Pungwe has a lot of packing space too, so there is no reason not to go for this smaller boat. The smaller kayak size means that the Pungwe is a lighter weight to carry too.